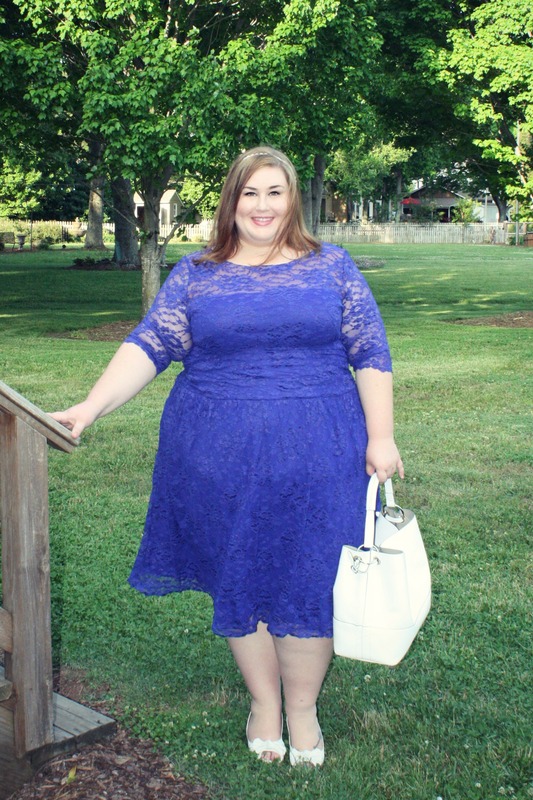 As part of Kiyonna’s Blogger Brigade, I have gotten the chance to try so many of their styles within the last year, but there was one dress that I saw many others wear that I hadn’t gotten my hands on yet — that is until now. 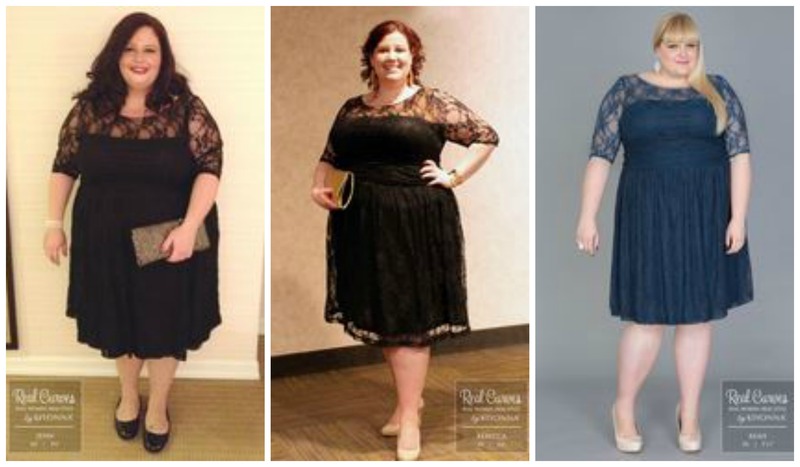 I love the design of the Scalloped Luna Lace Dress (slightly different than the regular Luna Lace Dress). I have the top version in two colors, so I knew I’d also love the dress. It’s perfect to wear to a spring/summer wedding, and I’m sure with the right jacket you could wear it out for a more casual day and evening too. For my first look, I went for a more evening-ish look with a statement earring. Instead of a high contrast necklace, the earrings worked in similar colors but picked up more on green than the blue of the dress. To bring in a different pop of color, I went with a berry colored lip (more noticeable in person). I also thought about how I would wear this with casual accessories. I’m a little in love with white accessories lately, so I went that route. Again, I didn’t have a necklace, so I decided a headband and bag would do. The dress fits like a dream. If you’re worried about bra straps showing, no worries! The sleeves are not lined, but the top/neck is, so you will not be able to see straps underneath it. So what do you do about accessories? Do you buy accessories for specific clothing items (or maybe events–which I’d probably do)? Is your style so consistent that it’s easy to mix around jewelry? Any tips? A great ensemble. That is a good color on you too. This dress is beautiful on you. I love the white accessories but if you were going to an evening event or more dressy, try black or maybe navy. The earrings are beautiful and I would kill for the white bag! 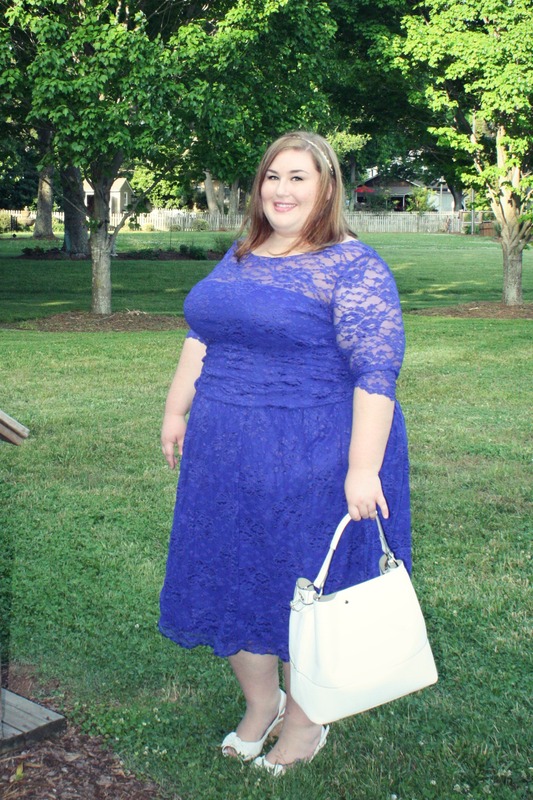 I love the sleeves on this dress as they cover a sometimes heavier upper arm but the lace just shows enough skin. I think anytime is a good time to buy accessories! You may come across something anytime and you may think it would look great with the dress, get it! But don’t over spend, It’s not a bargain if you don’t need it. Yea, I think if I had a distinct event to wear it to, I would get something for it. I need to start going to more fancy places haha. Gorgeous! 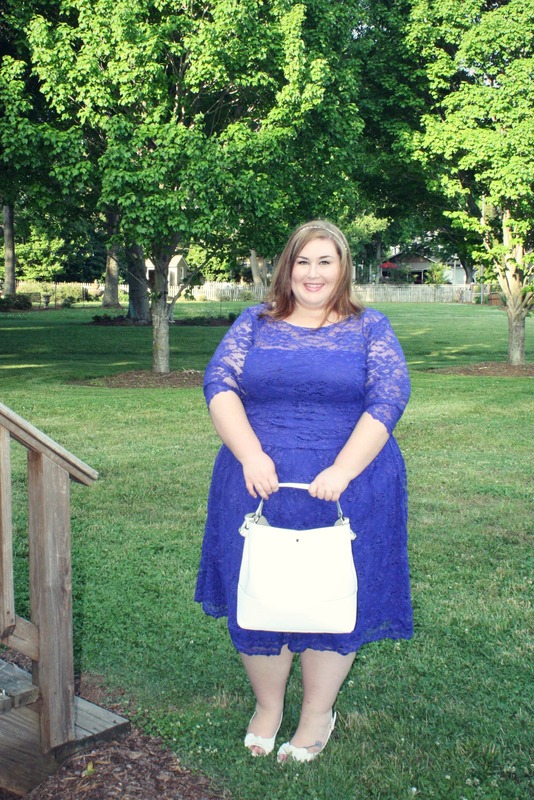 The color, the lace, your stylings, everything! 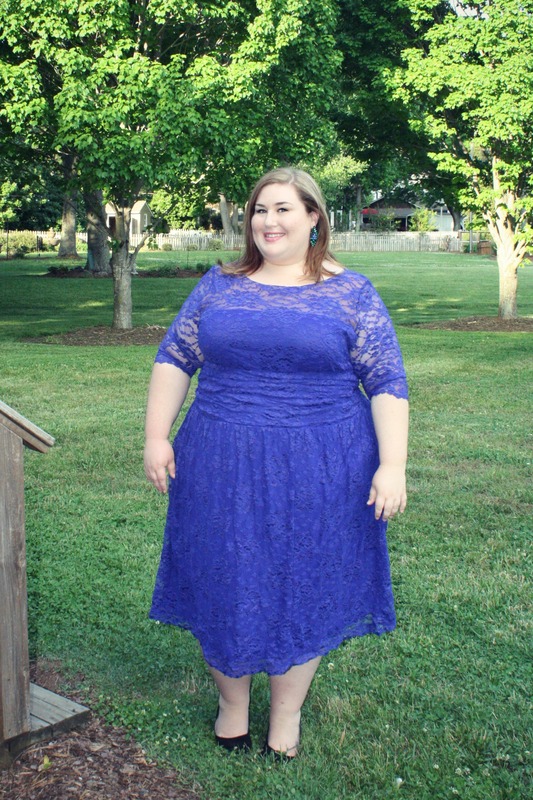 I’ve watched this dress come and go in different colorways, but this purpley-blue is a knockout! I love the statement earrings that you paired with it, and I agree that you could do a statement necklace for a completely different look. This is absolutely lovely on you. To do more with white accessories, a white denim jacket might be cute and create a more casual look overall. Funky bangles in a rainbow of colors and materials might create a more casual look, too. What a lovely dress! The white bag and headband look terrific with the outfit — bright and fresh, perfect for spring/summer as you’ve said. When it comes to accessories, I usually just work with what I have (unless it’s a super special occasion). The 3rd photo down — what a fantastic shot! Love the color of this dress on you. And the statement earrings. The length of the dress is nice too with a bit of flare. And how nice that you don’t have to worry about hiding bra straps, because I was actually thinking, “boy, she must have a great strapless bra”, and then you said you didnt need one! Look forward to seeing you in this in person! yes! That’s a great feature. I have 2 tops like this from Kiyonna, and they also have a lining so you can wear your normal bra. I love this dress so much!!! It looks great on you girl. Sometimes I buy pieces to buy things to go with, but i think my accessories are pretty versatile. I love that dress! You look beautiful in it! I want it, but I have no place to go in it! For jewelry,I usually go with metals like dinner, gold, or hematite when I don’t have a color that matches. With this blue, I probably would’ve worn gold. I prefer metals over everything else. 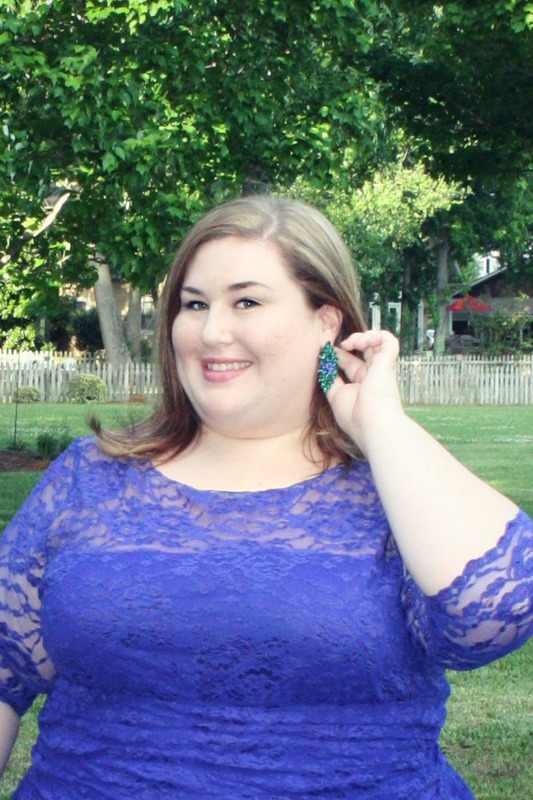 All the jewelry I really, really like is out of my price range though – boo! This is gorgeous! It should be your Date Dress! Don’t bother with a necklace if you’re wearing it on a date because it’s got such a delicate lace neckline. Adding anything else will draw the attention away from your face and you don’t want to distract your date with too many details. I agree about the neckline. Seems too pretty to put something on top of it!